I have never been so tense watching somebody buy bread. A slow burning nail biting thriller that questioned the very morals and ethics behind launching a drone attack. 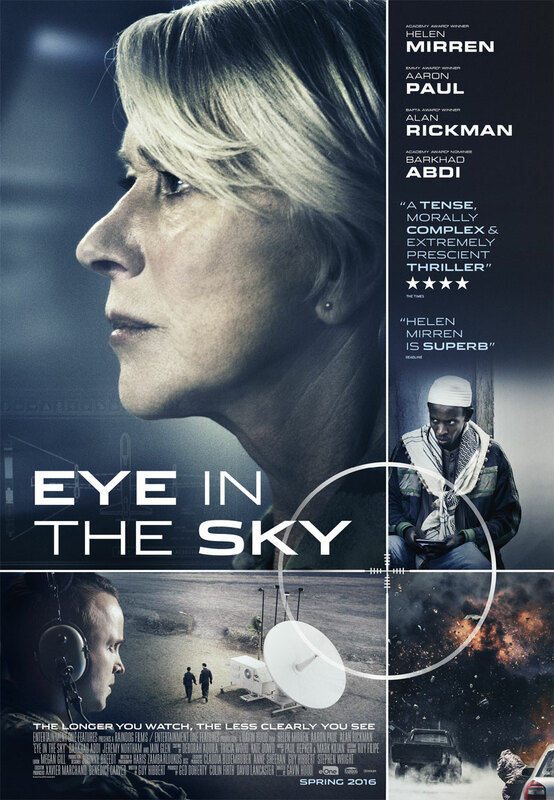 Col. Katherine Powell (Helen Mirren), a military officer in command of an operation to capture terrorists in Kenya, sees her mission escalate when a girl (Faisa Hassan) enters the kill zone triggering an international dispute over the implications of modern warfare. I was hooked from the moment the credits rolled. The tension bubbling from the off. The slow burning approach allowed us to explore what it actually takes to initiate a drone attack. I couldn’t believe how many task forces and officials were involved. The film flicked back and forth from one unit to another from the drone pilot right down to the on ground surveillance team. My interest hooked, lined and sinkered. The cast were superb. Mirren was brilliant as the ruthless Col. Hell bent on seizing a terrorist that has evaded capture for six years. Alan Rickman was on fine form as Lieutenant General Frank Benson. He really did steal every scene. It hit home a little more knowing that this would be his last feature. I liked how writer Guy Hibbert was able to incorporate some humour into this taut affair. I did laugh at Rickman’s old misery guts struggling to buy a doll in a toy shop. He can handle tough decisions and mediate between awkward politicians and military figures BUT can’t buy the toy that cries and poops. It was good to see Breaking Bad’s Aaron Paul break (Not intentional word play there) against type as the conflicted pilot who must drop the payload. The surveillance, aided with some cracking panoramic and landscape shots from the drone’s point of view, was brilliantly executed. The cool gadgets could easily have teetered on James Bond territory with remote control beetle drones flying around the compound. Barkhad Abdi (Captain Phillips) delivered another sterling supporting turn as Jama, the undercover operative who must sneak into the heavily patrolled village to obtain visual confirmation of the targets. Tense doesn’t even come close. What should have been a “no brainer” with three members of the most wanted East Africa terrorist list confirmed and minimal collateral damage reported; soon turned into a moral debate that questioned the very ethics of what is deemed acceptable in the rules of engagement. An almost 12 Angry Men scenario developed as the politicians argued about the implications of launching an attack on a friendly zone. There was some sharp satire with ‘the powers that be’ as they failed to make a decision. “Referring up” or passing the buck from one official to another. They even referred it back to the Americans in desperation. Their stance on the matter was very black and white; “Terrorist cell confirmed. Permission granted”. However, things took an even nastier turn when a little Muslim girl set up shop near the compound to sell bread. It really was a roller coaster ride. I haven’t been caught up with such a film in quite some time. I could feel my patience tested and loyalties divided as the chaos ensued. How much is collateral damage really worth? Monica Dolan’s (The Casual Vacancy) character Angela Northam infuriated me as the PC do gooder that demanded a capture option as one of the terrorists was a British citizen. Declaring her right to a fair trial. I could empathise with Powell’s frustration at the bureaucracy of it all and the endless “red tape” that she was cutting through to stop an active terrorist attack. The real time frame adding the extra pressure. BUT as the officials continued to stall (Even taking into account, the PR nightmare that the mission could incur), I found my own decisions changing as the drama unfolded with Paul’s Watts going out of his way to give the little girl time to escape the fallout. The closing moments were frenetic, suspenseful and heartbreaking with a sombre statement delivered by the great man himself, the late BUT always great Alan Rickman. A suspense filled thought provoking effort that is definitely worth your time.